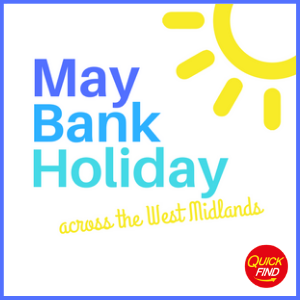 On the hunt for some Easter Activities across the West Midlands? 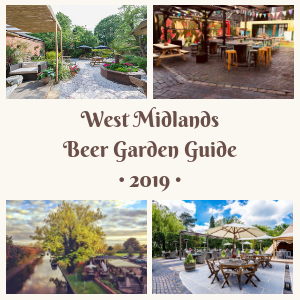 We have searched high and low to find the very best events taking place across the West Midlands. 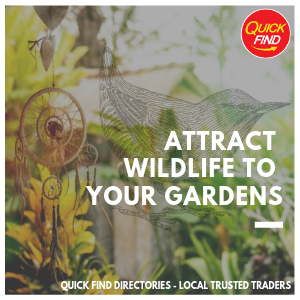 So whether you are on the lookout for egg hunts, outdoor pursuits, rainy day activities or just good old family fun - we are here to help. Over Easter West Midland Safari Park will be holding a whole host of eggstra Easter fun activities for the whole family, all included in the standard admission price! Ruby the Dragon has hidden her eggs from the dragon hunter. She has been very clever and disguised them well, but now she cannot find them! She needs your help! There is plenty happening at Drayton Manor this Easter, from egg hunts trails to egg selfie trails! There's the zoo, over 25 rides, Thomas Land, a 4D cinema, adventure playground and so much more. With so many fantastic activities taking place this Easter at the Black Country Museum, Take the Black Country Bunny's Trail exploring the canalside village, take art in an egg rolling competition and much on freshly basked hot cross buns from the bakery! This Easter weekend head on over to Kenilworth Caslte and go on a hunt for legendary dragon eggs. Set off on a quest to crack the clues, meeting characters from the past along the way, then claim your chocolate reward. 10am - 5pm. Adults £4, Concessions £3, Children £2.50, Family (2ad,3ch) £13, Under 3s Free. Have a cracking time this Easter as you eggsplore Selly Manor for our eggcellent egg hunt! Can you find all the clues and win a prize!? Get creative and make some Easter themed crafts and head outside to play the fun-filled garden games. Smell flowers in the garden and look out for all the spring wildlife about! Join in the eggsciting Easter Egg Hunt at Blakesley Hall. Find all the eggs in our garden to complete the hunt! Bursting with curios and awash with bespoke gifts, you will be spoilt for choice. Browse the quality hand-made crafts. Embrace the traditional art of rag rug making with an Easter twist on one of their workshops. Enjoy shopping at the Hatton Easter Markets. Find exciting traders selling crafts, cards jewellery, clothes and a whole host of amazing gifts and goodies. There's plenty of Easter fun to be had at Cadbury World, meet the cast and grab a photo, see both of the stage shows and watch live Easter egg decorating in the factory! Tickets must be bought in advance of the event. Get creative with a variety of sessions including: Potting Shed Sunflowers Craft Activity, Easter Crown Craft Activity, Creature Kites Craft activity, Story Sticks Craft Activity and Blakesley Hall Play Day. Join the Easter fun at Sarehole Mill with Easter themed crafts and solve the clues around the grounds to collect a prize with the Easter trail. 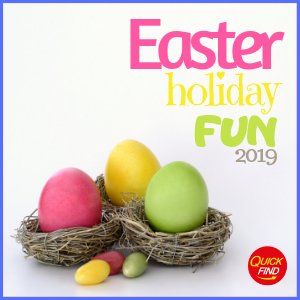 Plenty to keep everyone entertained; from interactive treasure hunts and creating Easter bonnets to discovering more about Shakespeare and his family tree. Activities included with admission fee. Book online to save 10% off tickets. Forecasted to be the biggest show yet, Insomnia 2019 is brought to fans by GAME, and gives you an opportunity to meet like-minded members of the gaming community in real life. The dinosaurs are back and they have left their eggs hidden around the museum. Help track them down and mark them off on your trail sheet to win a prize! Follow the Mini trail - join the costumed Mini mad mechanic characters, Madge or Martin on a family tour, as well as design your own Mini in our air drying clay workshops! Celebrate the Easter holidays at the Kingfisher Shopping Centre! With some great things happening to keep the kids entertained! Get messy and have fun in the Easter slime workshop at Umberslade Adventure. Learn how to make slime using PVA glue, baking powder and contact lens solution. They then get to customise their slime with paint, glitter and pop it in a fun Easter inspired pot. Get creative this Easter by building an architectural installation from masses of recycled cardboard. Ikon’s Laurie Ramsell assisted Hew Locke on the installation of Starchitect(2011) and joins the Family Team for the build. Most suitable for children over five, though younger family members are welcome. 10am—4pm. Entry is £1 per person, and under 1’s are free! Spring is on the horizon and we cannot wait for the arrival of the lambs, chicks and other animals at Becketts Farm. Come along and welcome new chicks into the world and say hello to some of our other animal guests including lambs, ewes and donkeys! 11am - 3pm. £2 per child. Free for members. The Easter bunny has been to Weoley Castle! Can you find all of the hidden eggs? Meet lots of your favourite story book characters including Alice, the Hatter, and the angry Queen as you explore this spectacular building. Admission fee plus activity price applies. During the session you'll be able to make 4 wonderful Easter crafts to take away with you. Places are limited - booking is essential. From 09:30am - 4pm Lil's Parlour will be hosting their CRAZIEST open day yet. Expect the BIGGEST CAKES, the most INCREDIBLE creations all based around the theme of Willy Wonka's Chocolate Factory. Expect cakes based around the characters in the book and film, edible wallpaper, scrumptious cakes, creations to make Augustus Gloop proud. As always a good selection of vegan cakes will be available. There will be INCREDIBLE chocolate bars made with ALL the candy just ready for an alternative Easter gift. Best of all .. one of these bars will contain a GOLDEN TICKET to win a free birthday cake of the value up to £70! Meet Farmer Fraser and his friendly animals including baby piglets, lambs, kid goats, chickens, ducks, geese and much more - all in the wonderful surroundings of the Selly Manor garden! Plus - animal themed crafts, fun farm animal trail, wildlife experts, storytelling and see the Tudor manor! Support the hospital charity's Children and Young People appeal whilst taking part in family fun activities at Sheldon Country Park where you and your family can take part in our Easter egg trail hunt. Once you have participated in our Easter Egg Hunt, filled in our activity sheet and returned it to the hospital charity tent, each child will receive a free Easter Egg of their choice! After the hunt, feel free to participate in any of the additional activities and rides that will be around the park. Join the Friends of Kings Heath Park and the Ranger Service for an Easter Egg Hunt and Easter Egg Painting in Kings Heath Park. Packed full of live entertainment, shows, toys, games, characters and family brands, there's something for all the family at Kidtropolis. Get your dancing shoes on, get those fins at the ready and standby because the Baby Shark mini Live show is coming to Kidtropolis. The chance to see your little one's face as their favourite characters are brought to life in this brand-new show. Full of fun, laughters and music, Bing Live! Is the perfect first theatre trip for pre-schoolers and their families. Totally reliant on donations from our supporters, Happyfields Sanctuary animal charity are hosting a dog show and fun day, join in the fun and support our local charity!